I’ve been thinking of wedding dresses a lot in the last couple of weeks. Of course it has been the talk of the town with the Royal Wedding, and Kate’s dress certainly did not disappoint. I wonder if they were having a First Dance however and how that magnificent train would have hitched up? I had a phone call last week from a bride who, after 2 lessons with me and a fab finished routine, suddenly discovered upon a final fitting of her dress that she couldn’t raise her left arm above her shoulder. We chatted through things for a half hour or so – me dancing around the kitchen with my baby in my left arm (now out of action for her), and the phone wedged between neck and ear and flailing around the other arm. We found alternatives, whilst she followed my steps in her kitchen on the other end of the phone! It was actually fine and very easily tweakable in the end but a last minute minor panic that needn’t have been necessary if we’d have known what the dress could do in the first place. Similarly a bride a couple of months ago suddenly discovered she couldn’t walk backwards due to the train. Luckily we still had another lesson and the steps were easily changed. 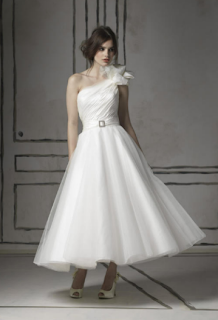 It is worth finding out the limitations of your dress though – whether you plan on having a first dance or not. It is a long wonderful day and although you realise that you will be moving a lot differently than if you were in jeans and a t shirt, there are still lots of things you will want to be doing. Realising the limitations of your movement in advance allows you to plan how you will do things. When teaching couples I constantly have to remind them (particularly the groom often taking vast strides around the room!) – that heels and a frock will be brought into the equation. This often leads to teasing the groom about Princess Di style frocks or mini dresses! The dress of your dreams is often one of the most important factors of a wedding and should be fully embraced, but don’t forget to get to know it a little before your wonderful day. PS. This goes for grooms too – don’t forget to check those new shoes for slipperiness!